RhiReading: Fight Night: Join me in cheering on Bren, my favorite O'Kane! 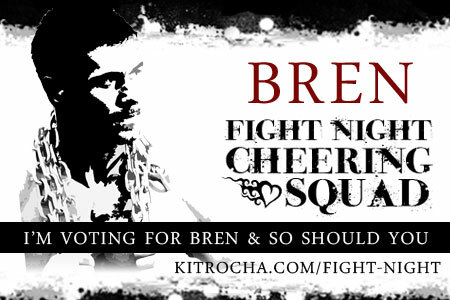 Fight Night: Join me in cheering on Bren, my favorite O'Kane! Had a productive weekend but so much more to get done this week. In the meantime just had to share a quick nudge to get on over and support my favorite O'Kane as he stomps his competition. If he wins that'll pit him against Ace in the next round and that will be an epic battle if ever there was one. I have a feeling I'm gonna have to get wild if that is where this goes... Ace has a lot of fangirls. I just got my properly sized Bren tee on Saturday so I'll be donning it for that fight... 'cause you guys are gonna go vote BREN and make it happen right?